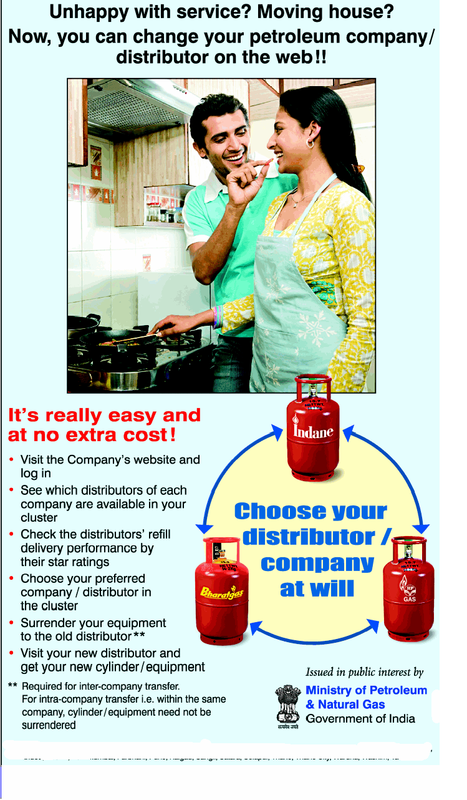 A customer can conveniently switch to another company's connection within 3-4 days if dissatisfied with the LPG company's dealer. The transfer can be done across dealers and companies by applying for the process online. To switch to a new company a customer will have to visit the website of the existing oil company then the customer needs to fill in the personal details on the website like name, address and consumer number mentioned on subscription voucher (commonly known as SV papers). After this, the customer needs to feed in the existing company and dealer's name and also the new company and dealer's name in the website to apply for the transfer. Once the application is sent online, an instant SMS alert would be sent to the existing dealer informing that his customer wants to switch to another company. All his information which he fed online would be sent across to the older dealer who would get 72 hours (3 days) to convince the customer about improving his services. If the customer still remains unconvinced, he can go to the older company and submit his SV papers.